Help a gamer win back his girlfriend by learning new emotions from people in his city! Can you help charm the love of his life?Help a gamer win back his girlfriend!Help a gamer win back his girlfriend by learning new emotions from the people in his city! Can you help charm the love of his life and make it back to your home and video games? 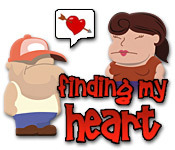 Learn life lessons from each character you meet while Finding My Heart!